When one of your friends is nice enough to hand over the keys to his new stainless and ceramic Daytona, you jump at the chance to take it out for a test drive. And where does one go with arguably the most enviable Daytona of the moment on his wrist? How about to a friend's apartment who has a mint condition vintage Daytona parked in his garage. A few days before this-two man GTG, I thought to myself "I should turn this meetup into a feature on Watch Patina..."
I was excited to photograph these two side by side with my real camera - not just my iPhone. To my knowledge, no photos exist of the ref. 6263 and ref. 116500 next to each other... And as far as what I would write about - I knew I didn't want to cover the usual fare you read in a watch review: a watch's measurements, a breakdown of its movement, the state-of-the-art materials it's made from, its bevy of complications, etc. I wanted to just describe my gut reactions from the sheer joy of wearing and being around them. I consider myself a purist when it comes to Rolex, so I didn't give the talk-of-the-town Daytona much of a chance against its older and wiser relative to win me over. No paparazzi photo of it - or review I read - had made me wanting to get in the line forming around the block. I ate my words as soon as I put it on... The first thing that got me was the dial. It's not porcelain, but it's damn sure rich in color. The white is the brightest shade of white I've ever laid eyes on - made even more striking when contrasted against the black outer tracks of the sub dials. Ladies and gentleman, if "panda dial" were added to Webster's, this dial should be in the running for the definition. The other feature that drives home the panda dial effect is the black-ish Cerachrom bezel. While I refuse to talk technical about the ingredients or processes used to manufacture it, I will say this: The ceramic bezel, especially this one, is a game changer. In terms of robustness, the ceramic bezel is doing for Rolexes today what the sapphire crystal did for Rolexes back in the '80s. I didn't test out whether it's truly scratch-proof, but considering that its aesthetics reminded me of a polished slab of marble, I'll take Rolex's word that it's pretty tough. And I call the bezel color "black-ish" because it's somewhat iridescent - the black chameleon-ing to a hazy grey tone depending on the time of day and angle you're looking at it from. And then I tried on the venerable 6263... Right after I firmly pressed the clasp closed and rotated my wrist 180 degrees to take in the "Big Red" "Daytona" logo, it hit me what wearing it felt like: It was like slipping on an old baseball glove. It had that broken-in feel of something well-loved for ages. And not only did it feel old, but it looked old too. But not in the scratched-up with a dilapidated bracelet way - this example is probably one of the best condition 6263s out there. What I mean by "it looked old too" is that the parts it's composed of, like the bakelite in the bezel, are clearly from an era when watch designers didn't rely on CAD programs. Another bygone part adding to the charm of the 6263 is its plastic crystal. Depending on the angle of viewing, the semi-domed acrylic crystal distorts the dial - making the sub dials wavy - like how a fun house mirror morphs a person. And speaking of availability, we enthusiasts and collectors have been informed by those in the know that our patience will be tested when it comes to landing the all-new Daytona. Does that mean production will be low? I'm kinda hoping so... 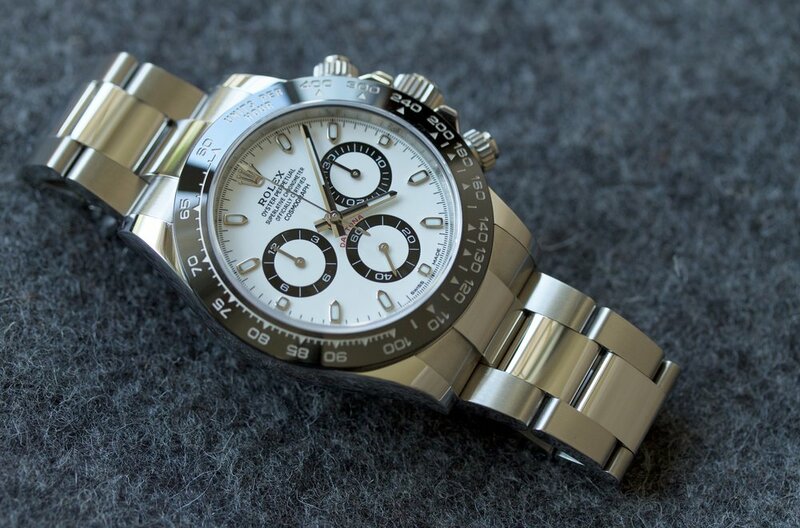 This Daytona is special; I don't wanna see it on everyone's wrist - like its predecessor the ref. 116520 seems to be. After wearing the 116500 for the better part of twelve hours, I came to the conclusion that its look is a tribute to multiple generations of Daytonas. The black bezel is clearly an homage to the bakelite inserts found on 6240s, 6241s, 6264s - and as you see here - 6263s. And the outer tracks of the sub dials are a throwback to the Zenith Daytonas of the late '80 and '90s. I defer my final observation of the 37-years-young Daytona 6263 to its owner who provided a simple answer, but to me, one with deep meaning. "It's not like I wear it every day, but when I do, I feel extra special about it," was his summation. We watch junkies are jaded. We sometimes think vintage Rolexes grow on trees because we see them all the time on Instagram and coming up for auction. The fact is, watches like this 6263, especially ones in top-condition like this one, are a privilege to be around, let alone to own.